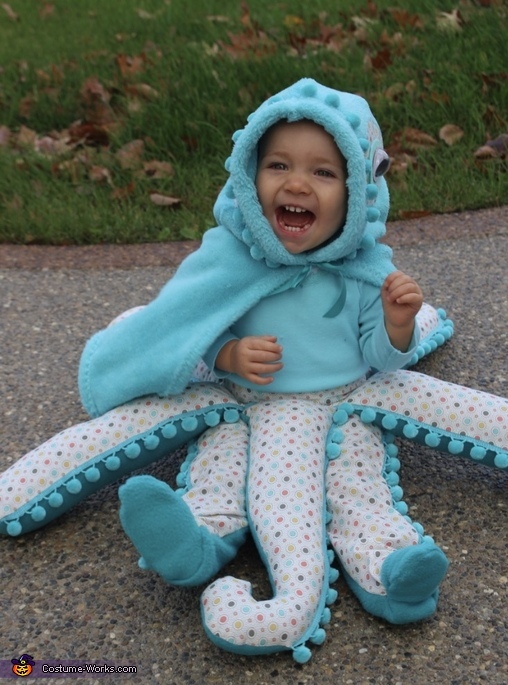 My 14 month old daughter Lucy is wearing a homemade octopus costume. The idea came from my oldest daughter wanting the baby to match her. She was a seaworld veterinarian. I used fleece, cotton, thread, stuffing, google eyes, heat and bind, and Pom Pom fringe. I measured my daughter and then created a homemade pattern for the pants of the costume. I then made a belt that had 6 legs on it. I wanted some of the legs to be straight and others to be curved. Lastly I made a cape to keep the wind out of her fav"cr and ears. I then put big google eyes on the outside of the hood. She was a cute octopus!!! Loved that it was warm in the horribly cold weather!! !